My roommate Joe and his girlfriend Allie headed out to Burger Lounge to pick up some dinner the other night and were kind enough to bring me back the restaurant's gluten free menu. You can see a partial listing of the menu here, but definitely ask your server for a full gluten free menu. The restaurant offers its Lounge Burger, Free Range Turkey Burger, and Baby Burger as gluten free options as well as the Fresh Vegetable Salad and Organic Quinoa Salad. With locations dotted around San Diego and Los Angeles I'll definitely be checking the restaurant out soon. If you've tried it, leave a note in the comments below letting me know what to order (and what to avoid)! 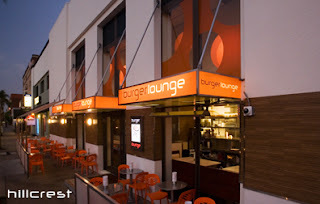 UPDATE: I finally checked out Burger Lounge last night at the behest of my roommate Joe and his girlfriend Allie. We all went together to the local Lounge in Hillcrest to place a to go order. I asked for the gluten free menu and, as I read it over, decided to stick with the Lounge burger on a gluten free bun. I figured I would stick with the original and see what the restaurant served up. In a word: amazing. I was a little nervous about eating the burger because the gluten free bun looked so similar to the regular bun which Joe and Allie were eating. While I wish I could normally expect gluten free food to be similar to "regular" food, after nine years of being gluten free I know better than that. The burger is cooked to be crispy with a slightly pink center and was delicious. All in all, Burger Lounge was great and I will definitely visit again.